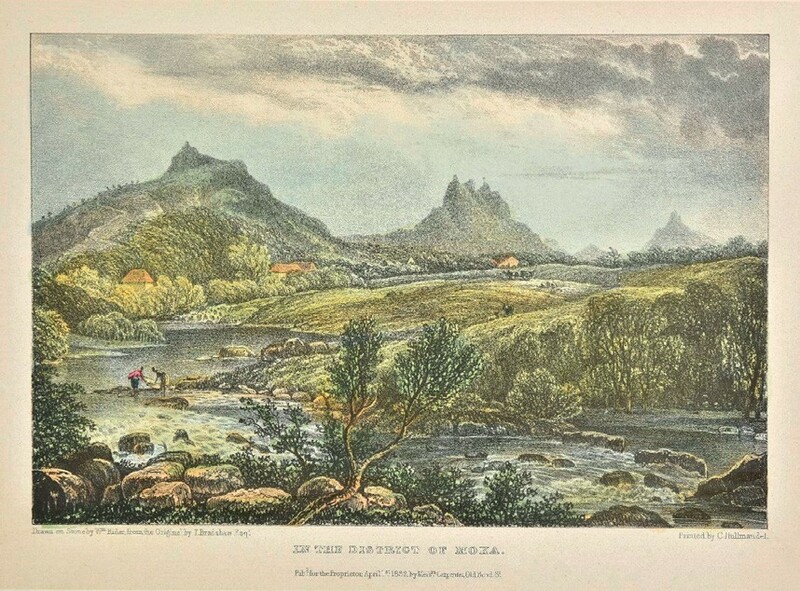 ‘In the District of Moza’, a plate from a coloured proof copy of Thomas Bradshaw’s Views in the Mauritius… of 1832, sold for £13,500. Sold for £13,500 by Dominic Winter (20% buyer’s premium) on November 7, this was one of just 28 copies in which the plates – lithographed by William Rider of Leamington – are printed on India paper and fully coloured. In all, just 123 copies were issued to subscribers, but the plates in the main run, said the auctioneers, appear to have been uncoloured. This copy bears the ownership inscription of Sir Walter Townsend- Farquhar, whose father, Sir Robert, was the first British governor of Mauritius, and the subscriber list records Sir Robert’s wife, Maria Frances, as a recipient of one of these rare coloured copies. As well as an eight-page introduction, each plate is accompanied by a leaf of descriptive text, and though there is some offsetting, the plates themselves are clean and fresh. The botanical section of the sale was led at £27,000 by a collection of some 370 watercolours of flowers, fruits and other plants produced c.1700 at Amoy (now Xiamen) by Dr Nun-Ko, a Chinese physician. Executed on mulberry paper, they were commissioned by James Cunningham, a Scottish physician attached to the East India Company. These drawings were sent back to England for presentation to James Petiver, an apothecary actively involved with the Chelsea Physic Garden, but Cunningham was a very active collector of specimens and dispatched collections of plants and illustrations to other botanists. Mosses also featured prominently in this part of the sale and bid to £11,000 was a group of 70 loose sheets mounted with numerous dried specimens that were ‘Collected in Capt. Franklin’s Expedition to the Arctic Sea [1819-22]’. A title-page attached to the collection is in the hand of Sir John Richardson, who wrote the sections on geology, botany and ichthyology for the official account of the expedition and in 1823 published a ‘Botanical Appendix’ to Franklin’s official Narrative… of that same year. Eleven men involved in Franklin’s later search for a North-west Passage died, mostly from starvation, and though there were unconfirmed rumours of cannibalism, survivors certainly resorted to eating lichens and their own boots. Cartographic highlights of the sale included a surprise in the form of an uncoloured Chart of the easternmost part of the East Indies and China, from Cape Comarina to Japan…, dated to c.1690. The work of the publisher, chart seller, engraver and sometime hydrographer to the East India Company, John Thornton, it was originally part of an Atlas maritimus…, first published in 1683. Estimated at £300-500, it went on to sell for £10,000. The Crystal Palace Game…, sold for £5000 at Dominic Winter. 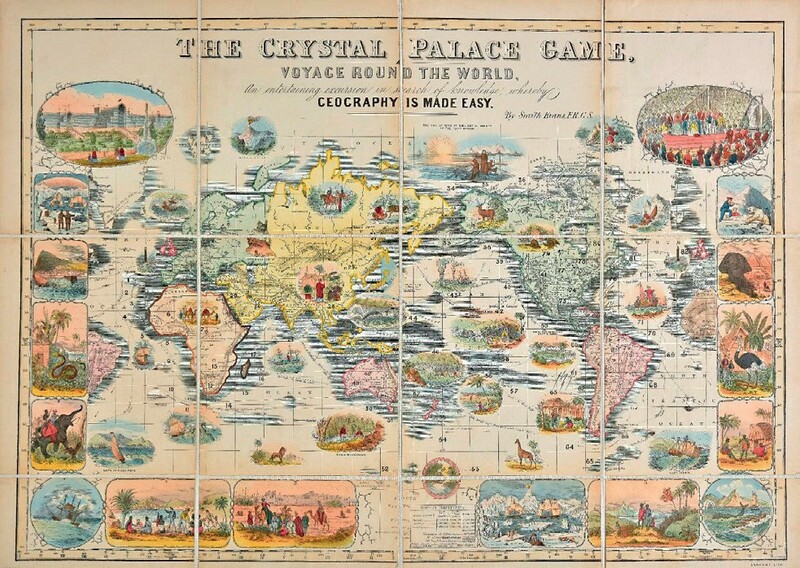 Sold at £5000 in South Cerney was The Crystal Palace Game, Voyage Round the World…, a wood-engraved and hand-coloured map of c.1854. Sectionalised and laid on linen to give overall dimensions of 19in x 2ft 3in (48 x 69cm), this educational game was the work of Henry Smith Evans. The entry for British library’s copy, which notes that it was lithographed by John Anthony L’Enfant, states that it was almost certainly produced to coincide with the removal to Sydenham of the Crystal Palace originally built for the Great Exhibition of 1851.